2018 marks the 55th year since Jack W. Heuer first unveiled the watch that would become the cornerstone of TAG Heuer. And to continue celebrating 55 years of the Heuer Carrera, the newly “re-invigorated” TAG Heuer did what it does best, and offered something premium and sophisticated in a reasonable and quite attainable (read: more affordable) product: the latest iteration of the brand’s most iconic watch, the Carrera Chronograph in the TAG Heuer Carrera Chronograph GMT. Thanks to the modular architecture that allows useful complications to be added to already existing movements, TAG Heuer’s premier in-house calibre is now infused with a GMT. 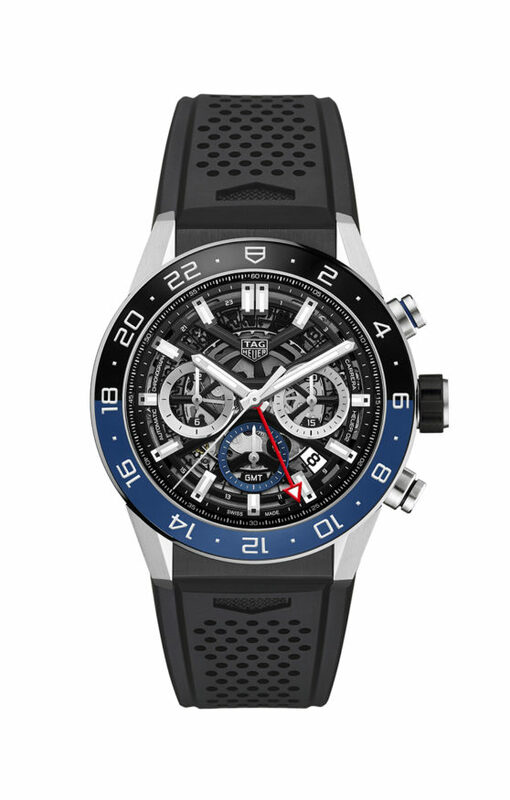 This marks a first for the brand, which guarantees that, not just globetrotters, but also die-hard enthusiasts of TAG Heuer will be happy. This inaugural edition goes the classic route with a big 45mm stainless steel case that incorporates its progenitor’s signature flat, faceted lugs, and its all the better for it (although we’re certain gold and titanium versions will be coming soon enough). Water resistant to 100 meters, the case is set off by a rakish two-tone ceramic bezel engraved with a 24-hour GMT scale that allows travelers to know if it’s day or night at home. For better or for worse night and day are represented by the colors blue and black, which, although aesthetically pleasing, makes this TAG look somewhat like the Rolex “Batman” GMT-Master II. But to be fair it could have been very different: the watchmakers could have gone with a black and yellow (night and day, get it?) combination. 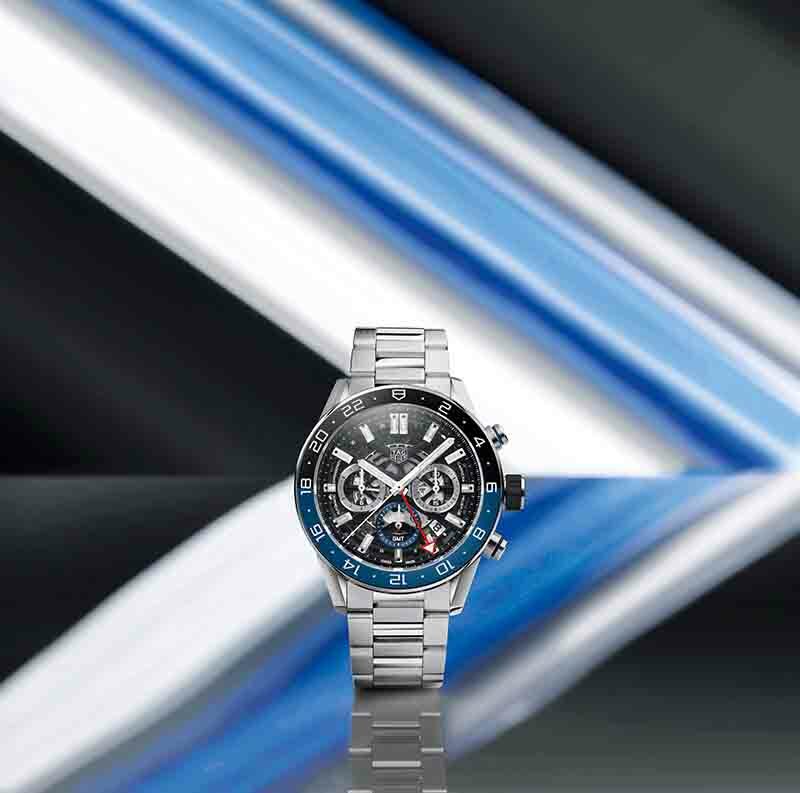 So, at least, the high-tech black and blue bezel combined with that skeletonized dial allows this Carrera GMT to continue flexing its avant-garde muscles. Speaking of which that dial is as gorgeous as ever. And even if its many “Hublotian” influences may be a tad too distracting for some the watch’s price point is nothing to complain about. Exceedingly modern and wonderfully dynamic, the dial is marked by rhodium plated and snailed chronograph counters, the minutes and hours in silver, and the small seconds in blue, all of which are suspended on a black skeletonized bridge in the classic Carrera 3-6-9 layout from 1963. To offset the business of the skeleton dial, the arrow-tipped, GMT hand is lacquer colored in a contrasting red, and is mounted in a secondary position between the hour and minute hands that enables it to pass over the indexes and skim the 24-hour GMT scale. A date display with its visible skeleton date disc sits at 4:30. While all the hands and binding post-like hour markers are drenched in Super-LumiNova for extended readability under poor light conditions. 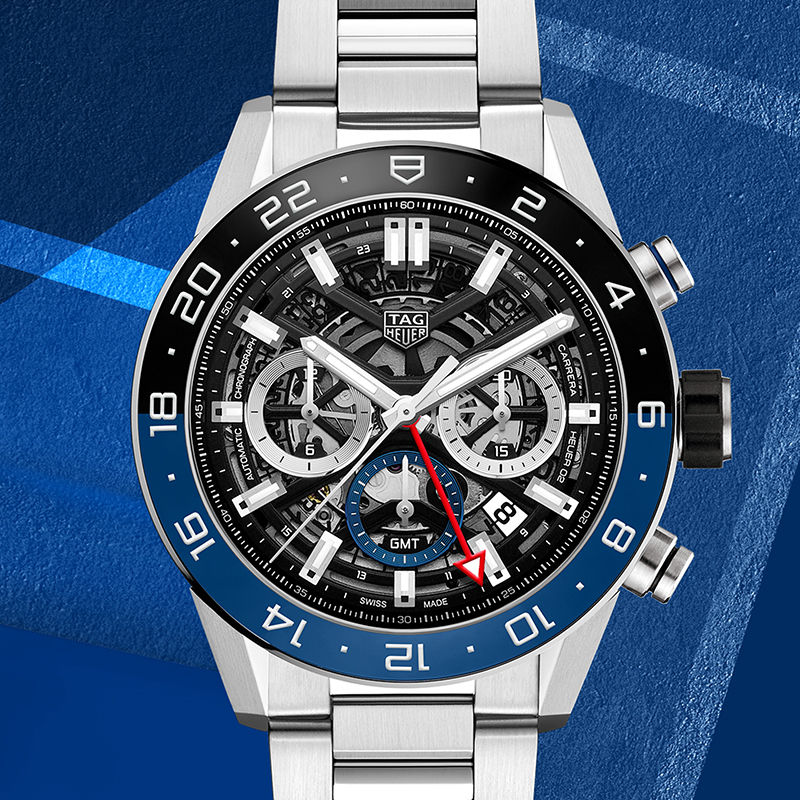 The beating heart of the watch is the upgraded Heuer 02 Calibre, which is entirely manufactured in-house. 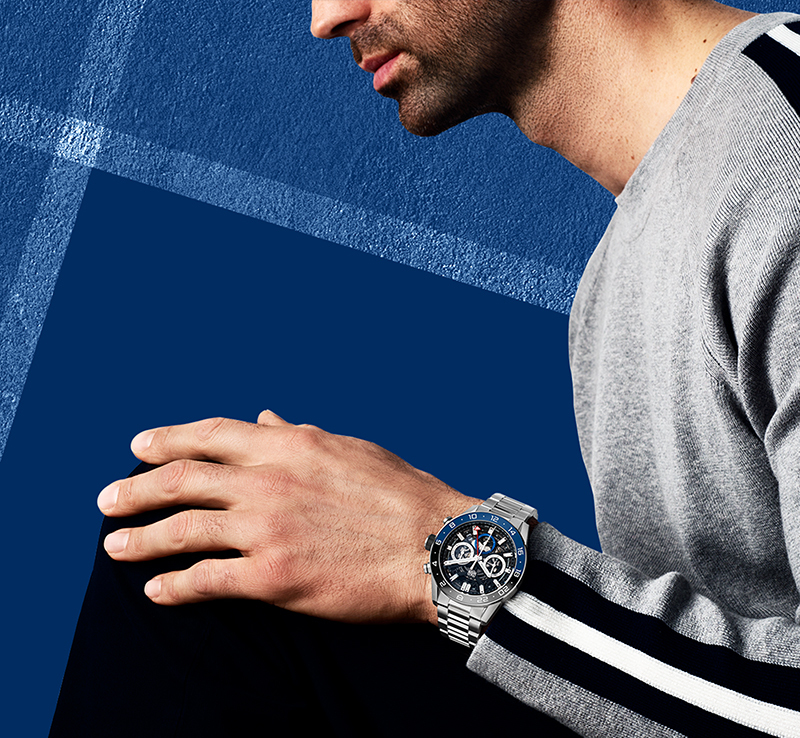 Based on the original Calibre 1969/CH80 featured in the TAG Heuer Heritage Autavia models, the Heuer 02 is a 168-part chronograph movement activated by a column wheel and a vertical clutch to ensure smoothness and accuracy. 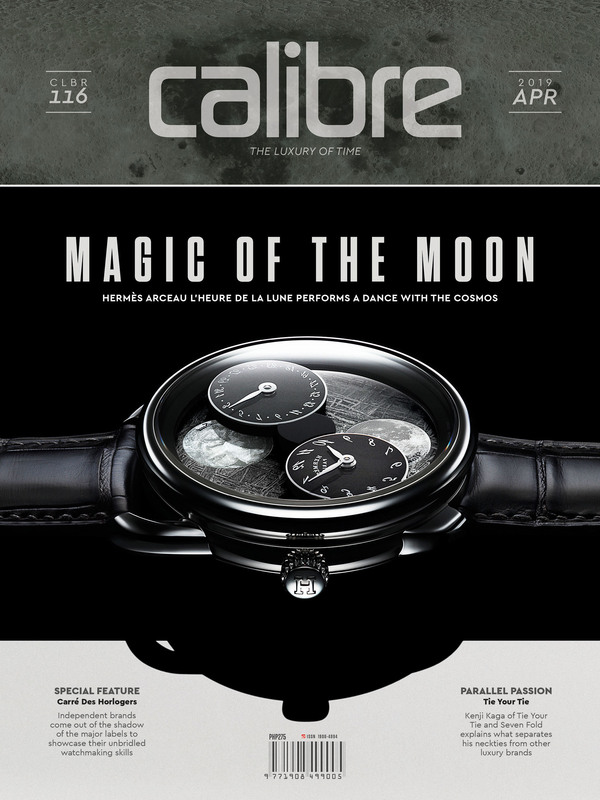 It is visible through the caseback along with its openworked black tungsten rotor. 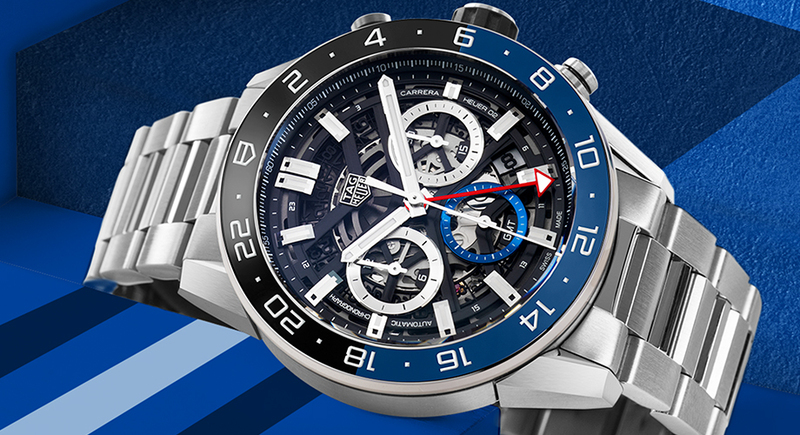 The TAG Heuer Carrera Chronograph GMT is available with either a steel bracelet or a rubber strap. 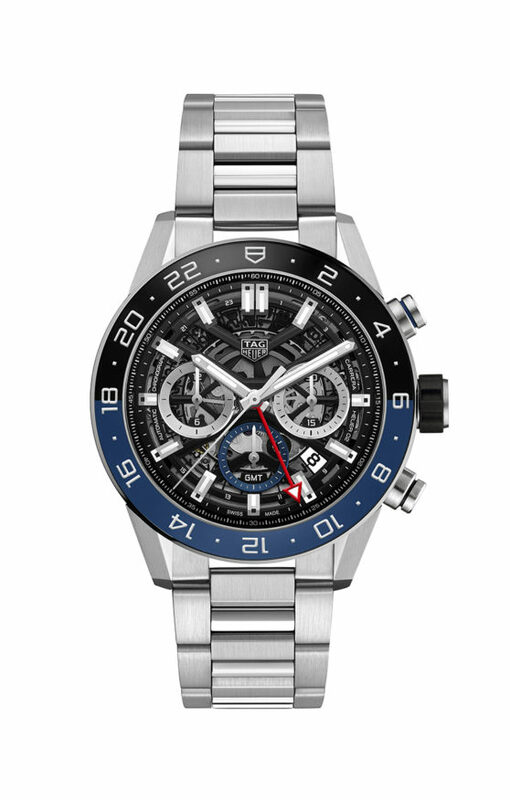 The latter is obviously the way to go, and when combined with that skeletonized dial makes this particular Carrera look more premium than its price would otherwise suggest. That’s a win-win in anyone’s book.